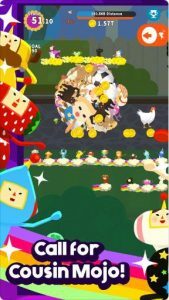 Game description : Tap to roll your Katamari and call Cousins to help you make a Star! You are the Prince, tasked by The King of All Cosmos to restore the universe and its stars by tapping. To do so, you’ve been given the Katamari, a magical ball that makes everything it touches stick to it. Grow your Katamari into a star and restore the universe! TAP the Katamari and start rolling! PICK UP 60 unique objects! GROW your Katamari to a legendary size! CALL 35 cousins who will help your Katamari grow with their strange powers! MAKE a star with your Katamari and get precious star tokens! BUY presents from The King of All Cosmos! GET animated stickers of Katamari characters that you can use in iMessage (only available from iOS 10)!